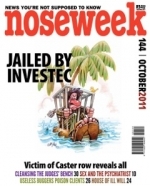 Three South African children under four were left stranded in Dubai after their parents were thrown into prison in Mauritius on trumped up charges laid by Investec’s CEO on the island. The pleasant Filipino couple looked genuine enough, but those pearly white teeth pack a nasty bite, writes Mark Thomas. Thuthuka Group - why am I not surprised ??? Chancers all !!! !